You may have heard of "The Long Tail." For games, it means your sales start off strong and quickly taper off. This force drives the retail marketing cycle -- launch a game to extreme hype, sell it like crazy, then immediately abandon it and move on to the next thing. Chris Anderson's book, The Long Tail: Why the Future of Business is Selling Less of More notes that given enough time, the "long tail" (the yellow part of the graph) can reach or exceed the size of the initial spike (the green part). Basically, if you reduce the cost of inventory and distribution, there's as much money to be made from selling an ocean of niche products by the drop as there is in selling big hits by the boatload. This strategy is at the heart of industry titans like Amazon, Netflix, and Steam. Of course, that strategy is reserved for big content aggregators who make their money regardless of whether any specific product does well. But can individual developers take advantage of the long tail, too? Bennet Foddy thinks so: in his GDC Talk, Learning to QWOPerate, he talks about how he self-published many small games on his site and used them to cross-promote one another. Eventually he stacked up all the long tails and made sustainable advertising revenue. after another -- it would take me years to build up a back catalog at the level of polish and scope I'm used to. So for now all I've got is one commercial title - Defender's Quest. 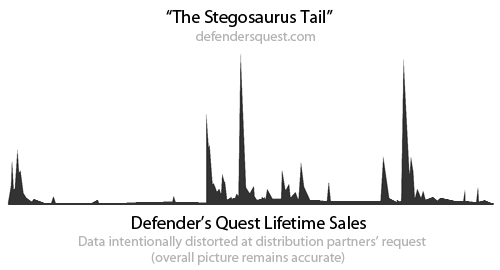 And if all Defender's Quest's got was a Long Tail, I'd be screwed. Instead, it grew spikes and became a Stegosaurus Tail. That's a chart* of our lifetime daily sales revenue over nearly two years. The far left side of the curve resembles the "Long Tail" -- a large initial spike quickly tapering off. But even this spike is noisy - as noted in Defender's Quest: By the Numbers, part 1, sales initially spiked with press coverage, then again when our demo was featured on Kongregate and Newgrounds. We had a few more small spikes from our big, free, "Gold Edition" update, but nothing major until our launch on Steam and GOG -- which brings us to where where we were at in Defender's Quest: By the Numbers, part 2. But after that, we had the Steam Linux Sale, various GOG promotions, and another huge surge when we launched our Steam Workshop support. Spike after spike, often several months apart. *Parenthetical: why distort the stats? In previous sales articles I gave detailed sales stats, including per-platform revenue breakdowns, but recent changes in the terms of service with some of our distribution partners forbid me from doing so again. The sales chart is thus intentionally fudged -- our real chart has the same overall shape but the exact daily sales are arbitrarily different. The portal(s) said they changed the rules because they have to keep developers' sales data confidential. So, in theory we could publish detailed stats, but people on the internet are too good at math -- they can combine those stats with sales chart positions to estimate another developer's confidential figures, and portals are afraid to indirectly expose another developer's confidential sales stats. I am still allowed to publish total PC sales stats across all channels mixed together, but I'm choosing not to do so at this time. But so what? How does this change the game? Long-term support can actually pay off! Under the Long Tail, the post-release sales strategy is to abandon your game. Give it just enough post-launch support while it's still selling strong, then move on to your next project. We took a different approach. Instead of immediately moving on to Defender's Quest II we put a lot of time into bug-fixes, patches, and content updates. Our biggest patch, "Gold Edition," upgraded our art style added New Game+ mode, and lots more. This was a gamble, improving the game to catch Steam's attention, and fortunately, it paid off (this was before greenlight). From that point on we looked for every opportunity to turn a content update into an excuse for a partner to promote the game. Examples include the Steam Linux launch and our Steam Workshop sale - the latter being one of our largest spikes ever. We've also had a lot of success in getting promotions from GOG.com. But before you go off and spend a lot of time and money on a content update, it's best to get your distribution partner to agree to a promotion ahead of time, in writing. When Defender's Quest first launched, the full price was $7. When we launched the Gold Edition upgrade, we raised the price to $10, and finally settled at $15 after launching on Steam. However, the game's full price is essentially a fiction -- you can see from the chart (and our previous articles) that pretty much all the revenue comes during promotional periods when the game is on sale. The full price is therefore just how much room you're giving yourself to go down during promotions. Accordingly, here's an interesting stat - while the full price has increased over time, the average price per purchase has remained about the same. All that's really changed is how deep we can make our discounts. In a perfect world I'd just keep the same medium price all the time, but that's just not how human psychology works. Developers often worry that players will complain about a higher price, but it's important to remember those players can always trade money-dollars for time-dollars by waiting for a sale. (You can see this process play out in this thread on our steam forum). "Sell your game for less and make up for it in volume" says conventional wisdom, but this only works if you can actually count on that volume to actually show up and notice that your game's on sale. The persuasive power of the promotion drives the sale, not the mere fact that it's discounted. For instance, Democracy 3 was Positech's fastest-selling game ever, even though it released at full price without the customary launch discount. Promotion drove those sales, not pricing. Video game sales promotions, be they Steam Sales, GOG Sales, Humble Bundles, etc, loosely follow this structure. They get your attention, show off cool games you've been waiting to play, give you lots of visuals, info, demos, and a ticking clock that presses you to act now! This is nothing new - department and grocery stores have been doing this since the late Cretaceous, and I'm surprised it's taken the games industry this long to evolve beyond the "launch at Full Price, then chuck it in the Bargain Bin" cycle I grew up with. Promotions give games a second wind. I define a promotion as strong consumer attention combined with a strong call-to-action. It's not just any attention. For instance, new developers often think exposure from a great review will make them rich, but I can say from experience it won't. Some articles have given us modest sales spikes, sure, but just as often we've had glowing write-ups that didn't even move the needle. And that's fine -- critical acclaim and financial success have never been joined at the hip, nor should they be. But if you're looking for raw sales, it's promotions you want. And the best promotions are front-page attention from a major distributor. Get real friendly with your distributors! Ideally, the relationship between developer and distributor is symbiotic -- the distributor gets a cut of your revenue, you get access to their audience, players get awesome games at great prices, and everybody wins -- ideally. This assumes that your distributor is benevolent, or as Daniel Cook would say, in the "Engage" phase of the Game of Platform Power (more on this later). But even if your distributor is on the side of the angels, it's still easy to get lost in their roster of other developers. "The squeaky wheel get the grease," as the saying goes -- if you don't ask for a promotion, you won't get it, and the only one advocating for your game is you. We talk to our distributors every time we start working on a content update, and we check in weeks or months ahead of every seasonal sale to make sure they don't forget us. Also, we frequently volunteer whenever our distributors roll out a new feature or promotional campaign. And as long as our interests align, I'm happy to do little favors here and there. For instance, I'm a big fan of GOG.com, so I've done several promos for them to help them reach out to other indie game developers. Another example is Kongregate, who promoted our game when we added an in-game incentive for anonymous users to sign up for Kongregate accounts. Now, I'm not advocating for being a corporate sell-out or an amoral shill ready to do every horrible thing in the book just to get revenues. I'm just saying that in ideal circumstances, your distributor relationship is a true partnership -- you help them, they help you, and everybody wins. All that said, it's important to remain vigilant because even the nicest portal today could turn to the dark side tomorrow, or the "Extract Phase," as Dan C. would put it. It happened with Big Fish Games in the casual market when they slashed developer revenue share, it happened with Apple and Facebook, and it tends to happen with console generations once they start to mature. The thing to look out for is "Rent-Seeking Behavior." Now, as above-board and transparent as companies like Valve are, nobody knows the future. Gabe Newell could always get struck by lightning, and an evil hedge fund could seize control of Valve and clean house. Wills can be and often are flagrantly ignored if the estate is valuable enough. As Moxie Marlinspike would say, it's not about trust, it's about trust agility. 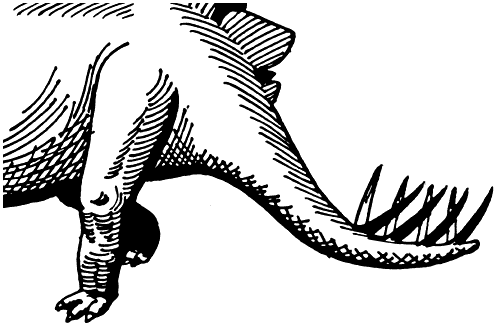 So those are a few ways the Stegosaurus Tail phenomenon changes the post-release game plan. But if you look closely at history, Steggy has been with us all along. Some game companies have already been "riding the dinosaur" for decades, most notably Nintendo. Back in the 90's when other publishers would routinely consign their back-catalogs to obscurity as soon as their games were off store shelves, Nintendo never stopped coming up with new ways to re-sell us classics like Mario, Zelda, and Metroid. GOG.com has been doing the same thing with classic PC games for years -- taking old abandonware gems, polishing them up, and giving them a new lease on life. Major publishers have since joined in and even Steam has joined the party, most notably with System Shock 2. What's really cool, though, is Steggy's power to re-write history. Double Fine's Psychonauts was a critical classic but a financial flop, until it was re-released on PC many years later and finally got its chance to shine in the light of Steam Sales and Humble Bundles. What works for the big boys can also work for us small developers -- if you're able to release multiple games, you can use them to drive interest in one another, giving your back catalog a kick every time you come out with something new. For instance, Zeboyd games sells Breath of Death VII and Cthulhu Saves the World as a double-pack, and included these and other games of theirs as backer rewards for Cosmic Star Heroine's Kickstarter campaign. We've been doing the same thing -- Defender's Quest 1 now comes free with every pre-order of Defender's Quest 2, and we've updated the original game with a free in-game item for those who visit the Defender's Quest 2 page. Since we added that feature, not only do DefQ2 preorders closely track DefQ1 sales, daily DefQ2 preorder revenue exceeds daily DefQ1 sales revenue. We still have a few tricks up our sleeve to add a few final spikes to our tail. When we first launched, nearly all of our direct revenue was driven by referral traffic from our web demo hosted on Kongregate and Newgrounds, so we're in touch with both of those sites about future promotions. Also, we'll soon be launching a Japanese translation as part of our new partnership with Playism, distributors of awesome Japanese indie games like La-Mulana and One-Way Heroics, and a German translation should go out any day now. There's some downside to maintaining a Stegosaurus Tail -- it's hard, boring, work. What I love doing best is making games, and although every new spike I successfully chase down feeds my family and keeps my career afloat, it also distracts me from pouring my soul into my next project. After over a year of nurturing her, Steggy's starting to wear me out. And before I close, I want to note that no single strategy works for everyone, nor does it work forever. Much has changed since Defender's Quest first launched -- back then, Steam was hard to get into, but easy to get noticed on. Today, with indie games literally being greenlit by the hundreds, it looks like the future will be the reverse. Maybe Steam will follow my predictions and solve discoverability in a way that's both sane and equitable, but that's far from certain. Furthermore, the long-term effects of Steam-style promotions is unknown. With players building up huge backlogs, will they keep buying new games like they used to? With the ground shifting underneath us, and amidst all this talk of an "Indie Bubble," I think it's best to double down on the fundamentals -- sell direct, know your audience, make sure they know you, diversify your sales channels, and if you've got a back catalog, milk it for all it's worth. The last lesson I've learned is this -- a great game is not disposable. Just like a little kid watching Star Wars for the first time, someone out there is waiting for your awesome game to captivate them, they just don't know it yet.